As its name suggests, this Fish Tank Induction is ideal for those clients who are interested in tropical fish life and this induction would also be useful for clients who are using hypnotherapy to help with issues connected with self-discovery and personal development. The visualization contained in this script creates the right environment for the commencement of analytical issues as it encourages clients to begin their inner search for clues about what they want out of life. 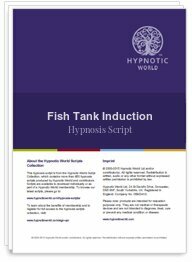 Download this Fish Tank Induction script today.